At Gizmodo, there are few things more rewarding than eating your own words. So here I am. It’s been six months since I reviewed the apparently boring new Google Chromecast, a gadget I said “falls short” and called “a bummer.” Now Google has effectively turned the Chromecast into the video game console of the future. This is me eating my own words. Eating one’s words does not exactly mean the same thing as saying you’re wrong. When I argued that Google’s latest $35 Chromecast disappointed some folks by failing to deliver full-fledged set-top box solution, I was right about that. Now that Google has linked Chromecast to Stadia, the company’s broader mission to create a cloud-based video game empire, I realize that my eye was on the wrong ball. The new Chromecast is still boring for TV watchers, but it’s suddenly fascinating for gamers. The future it invites is hardly a bummer. In case you haven’t followed the news, Stadia is Google’s new attempt at creating a streaming video game platform. The basic idea is that any device that works with Chromecast—this includes everything from a Mac running the Chrome browser to a TV with a new Chromecast plugged in—will be able to access video games through Google’s existing data center network. The games won’t actually run on the devices. They’ll be streamed from these data centers in 4K resolution at 60 frames per second. This is where the new dongle’s specs come into play. It seemed underwhelming late last year when Google released the latest iteration of the standard $35 Chromecast, and the main spec bump included the ability to support 1080p video at 60 fps. My reaction at the time was pretty blunt: Who cares? The latest $70 Chromecast Ultra has been able to cast 4K HDR video at 60fps for years, although I’ve read some complaints that the device can get glitchy when doing so. Furthermore, that 60fps detail for both Chromecast models is something that typically only gamers care about, and the idea of casting video games onto a Chromecast-enable device seemed almost quaint six months ago. At the very least, getting a Chromecast to handle massive quantities of streaming data required for the very best video games likely requires the right connection speeds and the right router. With the launch of Stadia, this scenario seems very different. If what Google seems to be promising is true, we’ll soon have a streaming platform from Google that rivals the gaming experience you might get on a PlayStation 4 or an Xbox One today. Google makes it seem like Stadia will be better, faster, and more powerful—not to mention more convenient. The company’s keynote at the Game Developer’s Conference in San Francisco showed how you could go from playing a game on a PC to a Chromecast-enabled TV with a new Google Stadia controller in a half second. Of course, that cheap Chromecast hardware wouldn’t be nearly as capable if it didn’t support the gaming standard of 60fps, which the new Chromecast now does. The cheaper dongle is still stuck at 1080p, though. All the buzz around Stadia centered around a 4K gaming experience and not all existing Chromecast device can support this. 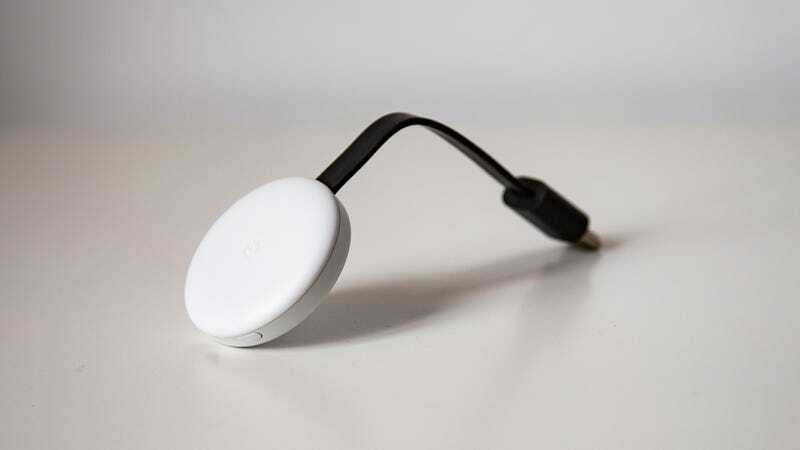 But Google will probably release a new Chromecast model with beefier new specs in the near future—our guess would be before the service launches sometime later this year. Google said it hopes to support 8K video at 120fps on its new platform, so maybe this year’s (hypothetical) Chromecast update will be truly mind-blowing. So I’m pleased to confess that Chromecast is not a full bummer any more. The dongle still needs an update, and while a lot of people would love to see Google release a full-fledged set-top box that runs Android TV, the fact that Chromecast is now a gaming machine is pretty cool. Now we just have to wait on answers to the laundry list of questions raised by the announcement of Stadia. We don’t know when it will launch, what it will cost, and how it will work. We do know that it will work with Chromecast, though.